BUST was formed in 1991 by Frenchay Hospital patients Pamela Corrigan, Carol Thomas and Margaret Twiggs, when they learned from Consultant Surgeon, Mr Simon Cawthorn that his team needed a £20,000 ultra-sound scanner. The trio raised the money within two years and their impressive achievement led to the creation of the hospital’s specialist Breast Care Centre with its One Stop Clinic. All members of the BUST Committee are unpaid volunteers. 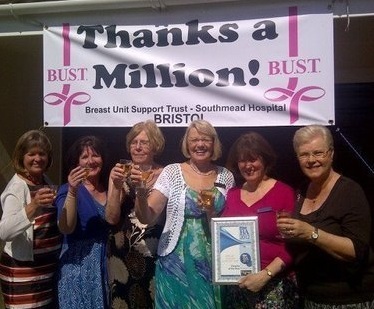 BUST is now the major funding partner for the Southmead Breast Care Centre and has also donated equipment to the Avon Breast Screening Service. The funds raised by BUST and its supporters enable the clinicians to buy advanced equipment before it is available through NHS funding. The Southmead Breast Care Centre is now widely recognised regionally and nationally as an excellent centre for Breast Care Services because of the dedication and caring attitude of its doctors, nurses and administrative staff and the work of BUST.